This post was supposed to be cleverly titled, “Look ma! I still have hands.” And, it was supposed to contain a picture of me victoriously yielding a circular saw for the very first time ever. Alas, I am still not all that fond of circular saws. Here’s the walkway that I had to finish destroying. 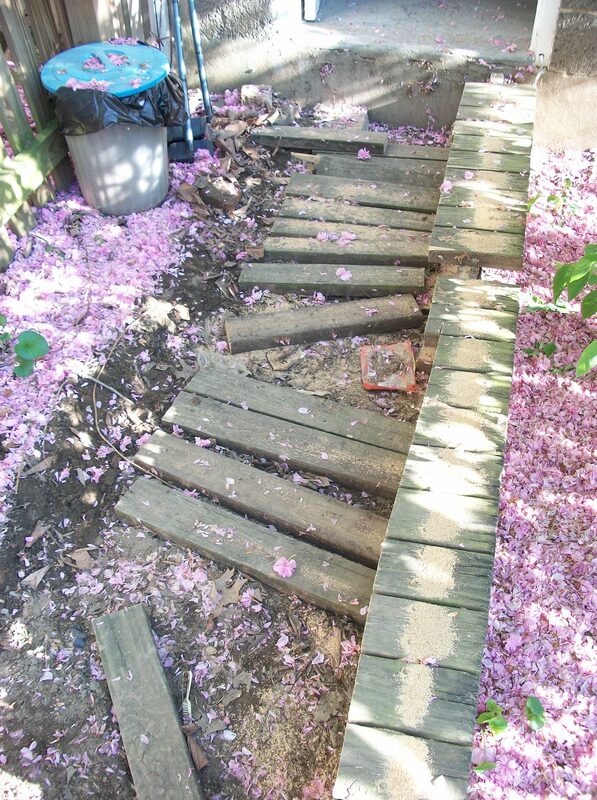 If you’re curious why there are random boards missing in the walkway, you can read all about the ridiculous battle that I’ve had with this walkway. The many episodes that led up to the missing board and that followed the board removal have surely left the neighbors thinking that I am certifiably insane. I’m getting antsy to see some forward movement on the walkway, and the last time that I went outside to pry up boards, I pinched my finger and dropped the crowbar on my foot, so it was time to dispense with the measly hand tools and to face my fear — saws, more specifically saws powered by electricity. I went to Home Depot the other day and bought a sweet circular saw with a laser, so I could see where I would be cutting. It also has lime green accents and was hands down the prettiest power saw in the bunch, not that I guess that matters too much. Then, I asked my friend Danielle to come over and babysit me while I sawed the deck apart. She’s a nurse, so I figured if things went horrifically awry, she’d be there to put my severed limb on ice. I read the saw directions, especially the ones about kickback, which I fear more than anything else when holding a circular saw. I attached the blade. And, I did cut some boards off the deck. This was the part where a victorious picture was supposed to be taken, but since I wound up being pretty much a chicken, I thought myself not worthy of the victory picture. It was slow going because every time the saw made a funny noise or slowed down, I stopped the saw, got out the crowbar and finished pulling up the board by hand. To my credit, the saw did kickback a few times, and I did manage to handle it without putting a gash in my leg or taking off a thumb. When Danielle asked me how I was doing though, I admitted that I was feeling pretty frazzled. I just kept looking down the stretch of boards and counting down the sections that I had to navigate safely to call it a day without bloodshed. God, bless Danielle. She offered to take over. Handing off the saw to someone only a few cuts more experienced than me didn’t really ease my nerves all that much, but Danielle powered though the rest of the boards. We found it worked best to make one cut. 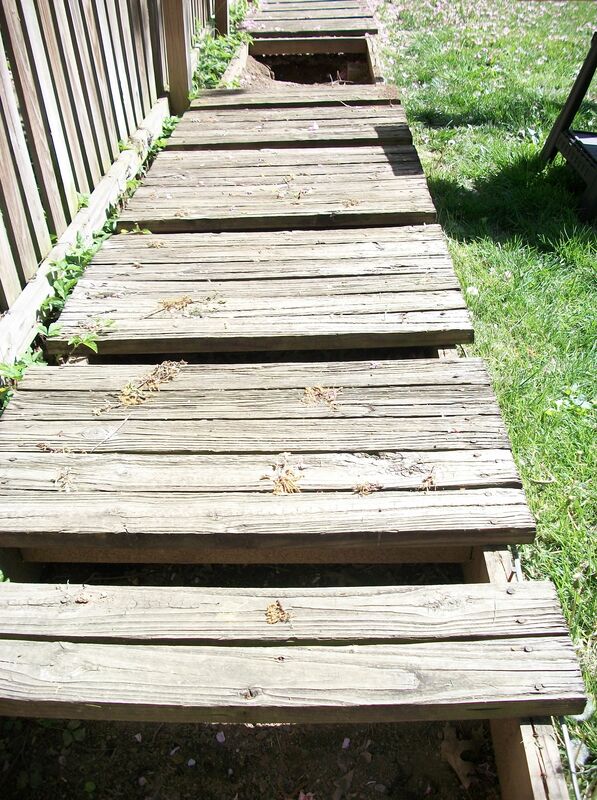 Then, we could use the leverage of the board to quickly rip the board out of the other side of the decking framework. With her wielding the saw, I followed behind picking up the boards and pounding down the nails, so the garbage men won’t get stabbed by them. I should have taken a victory picture of her. Here’s a picture of her handiwork. Notice that one side of the deck framing is gone. Except for where the framing is nailed to the main decking board of the house, this deck was attached to absolutely nothing. It was resting on a few cinder blocks. There are no posts at all. 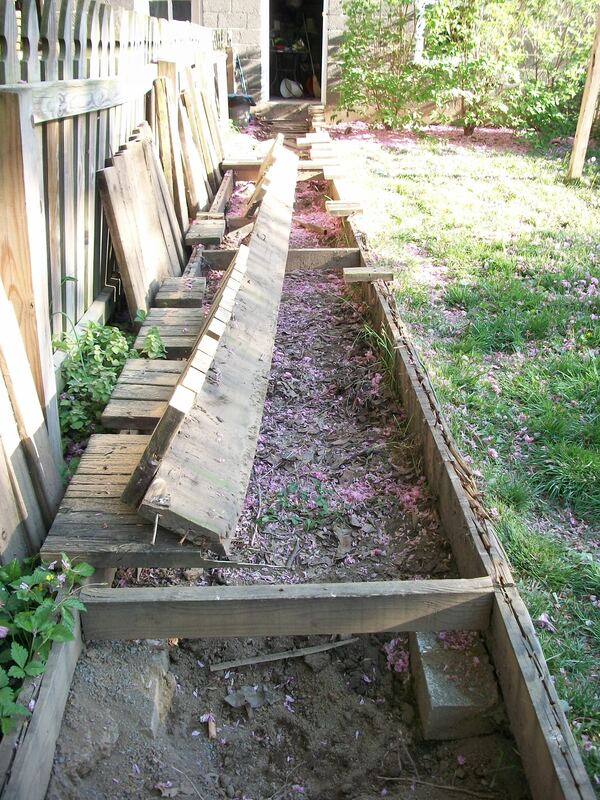 This doesn’t surprise me since the deck was built out of 2x4s instead of traditional decking lumber. And, despite not being good deck construction, the lack of posts is a blessing because with just a little tugging and convincing with a crow bar, Danielle and I were able to wrestle some of the framework out of place. Oops. I just realized as I was uploading the picture that I need to go out and hammer down those nails on the end of the board in the morning so the dog doesn’t impale himself on them. Now I can start cycling the old decking out to the trash. 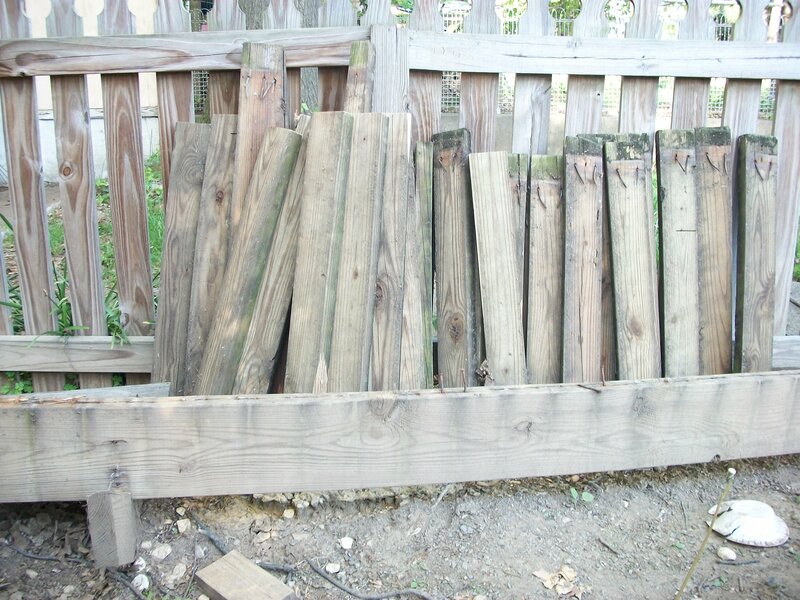 Since I’m scared to anger the trashmen, I hesitate to put more than 15 boards out at a time. It could take awhile to clear the yard at that rate. 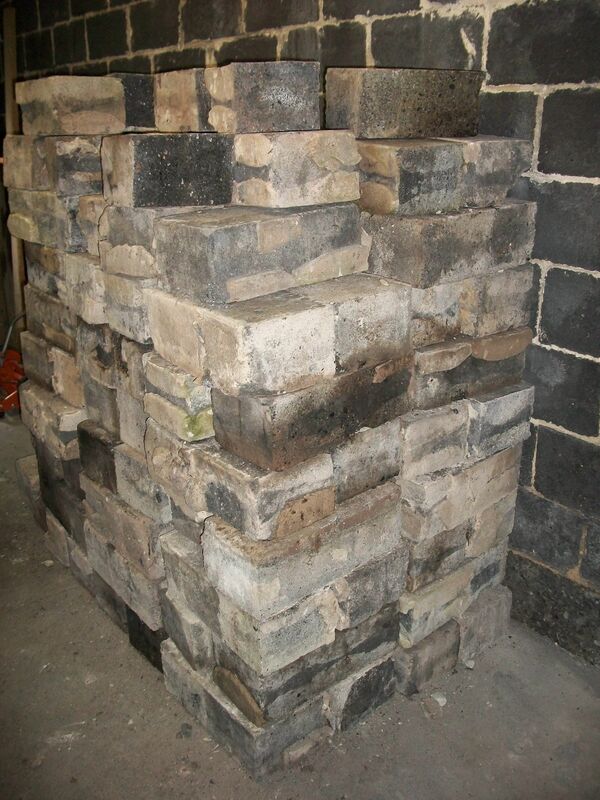 But, at least now, I can start to dig and figure out how to get this massive pile of concrete blocks down for the new walk. They are ridiculously heavy as a group of my friends discovered when they helped me haul them home. I reconnected with a former student last night while participating in a super fun scavenger hunt, and he works in landscaping during the summer. He said he’s open to freelance work, and I have a feeling that I’ll be throwing some freelance work his way. I’m not sure I have it in me to dig the squares for all these blocks and then the strength to wrestle all of them into the holes. Plus, even if I did muster up the strength, if the job is taking forever, I’d probably rather be quilting anyway. 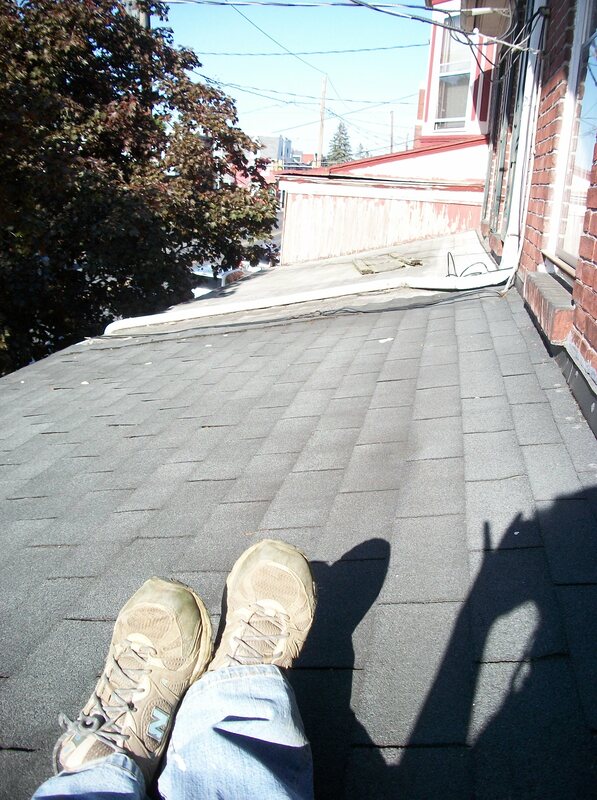 To redeem some of my pride after the bruise to my ego of not exactly conquering power saws, I will try to redeem myself somewhat by ending with a picture of my feet on my roof. I climbed out there to put the downspout back that blew off the roof during Hurricane Sandy. Going out on the roof is more than what some girls would do, right? I’m proud of you. Maybe the saw blade was not at the correct depth setting, and that caused the kickback. Before plugging it in next time, hold the saw up to the board that is to be cut and lower the blade so that a full tooth depth is extended past the thickness of the board. About the walk – how about if you put gravel in there as a base, and then pour concrete for a wonderful no maintenance walkway?